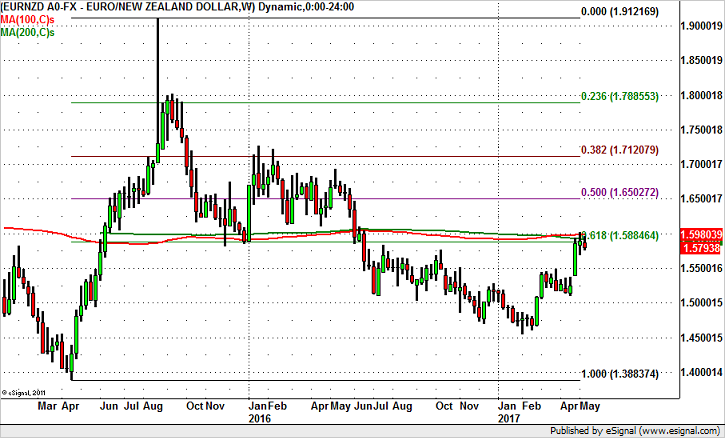 We like buying New Zealand dollars ahead of the Reserve Bank’s monetary policy announcement this week. Data from New Zealand has been pretty good with dairy prices rising for the fourth auction in a row and job growth improving in the first quarter. Employment increased by 1.2%, which helped to push the unemployment rate down to 4.9%. There’s been widespread improvement in New Zealand’s economy since their last meeting in March. Consumer spending is up thanks to a stronger labor market. Inflation and dairy prices are on the rise. Consumer and business confidence weakened but that could turn around as service and manufacturing sector activity continues to improve. The housing market is softer which the RBNZ wants to see. All of this argues for optimism from the Reserve Bank who already felt that the growth outlook was positive in March. We have chosen to buy NZD vs. EUR because Emmanuel Macron’s victory failed to inspire the strong gains in the euro that everyone had hoped for and instead, euro fell victim to buy the rumor, fade the news selling. European currencies are trading lower across the board this morning and it appears that more profit taking is possible. Technically EURNZD has a lot of resistance below 1.6000. The attached weekly chart shows the 100 and 200 week SMAs hovering between 1.5880 and 1.5920 and the 61.8% Fibonacci retracement of the 2015 rally at 1.5885.